The best cannabis seeds can be found in our new seed shop. Use the filters on the left to search your cannabis seeds. With top labels such as Dutch Passion, Royal Queen Seeds and Greenhouse Seeds you can quickly germinate your own marijuana plant. You want to buy cannabis seeds, but you are unsure which ones? At the Dutch-Headshop you will encounter all cannabis seeds at one section. To make the right choice, you can filter the cannabis seeds on your favorite strain and properties. Cannabis seeds come in many types, and each type has, of course, its own qualities. The effects of cannabis seeds can strongly vary. Listed below are the most important effects. When purchasing cannabis seed, you can choose between feminized and feminized autoflower cannabis seeds. Feminized cannabis seeds only produce female plants. Female cannabis plants create much higher levels of the active substances THC and CBD than male plants. Feminized autoflower cannabis seeds will flower automatically, in contrast to non-autoflower cannabis seeds. These plants also often stay smaller than non-autoflower cannabis plants. You can soon harvest with feminized autoflower marijuana plants, and there is no risk you have male plants. THC and CBD are some substances produced by marijuana plants. Especially THC is an active substance in cannabis. The difference between both substances is that THC has a psychoactive effect, while CBD hasn’t. In both cases, the plant has a higher level of THC and CBD. Only a handful of specialist seeds contain more CBD. In some cases, the THC:CBD rate is 1:1. This means that the THC percentage is equal to that of CBD. These CBD-rich seeds we call Medicinal Marijuana (Mediwiet) seeds, as they are specially cultivated for their medicinal properties. Before growing marijuana, it is important to take into account several factors. The flowering time, harvest month, cultivation site and yield of cannabis seeds are of course important. The length of the plant's flowering time in general lies between seven and ten weeks. The harvest months are from the beginning of May till the end of October. Autoflower marijuana plants are in particular suitable to harvest in the months May till August. 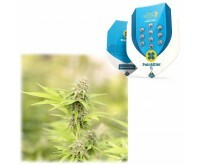 Autoflower marijuana seeds automatically flower, while non-autoflower plants start flowering when days get shorter and plants receive fewer hours of light. Almost all cannabis seeds are suitable for both indoors, outdoors and greenhouse cultivation. Some plants need to be cultivated indoors, while others grow best in the open air. You can order cannabis seeds of different brands at the Dutch-Headshop. Of course, you can filter on your favorite brand. Listed below are all brands. Start growing right away! Choose your favorite cannabis seeds and order them easily and discreetly at the Dutch-Headshop.